“Our grandparents left us many ceremonies which help us reconnect with ourselves. The Moon Dance is one of them. Nowadays men are being included in the Moondance circles, since we entered another vibration, the vibration of the sixth sun, which is the age of Aquarius. Now men and women have the chance to make a change in the harmony between the Sun and the Moon. This will provide the opportunity to the families of the future to have a more spiritual and committed life with our children and mother earth. 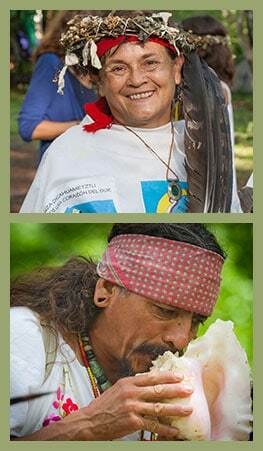 Reuniting women, men and children with the Earth and the essence of the Moon, this sacred, four-day ceremonial dance is a remembrance of the ancient traditions of these lands of the Americas. Through sharing sacred songs, teachings and movement, a deep and profound healing can be evoked. Each step is a prayer. 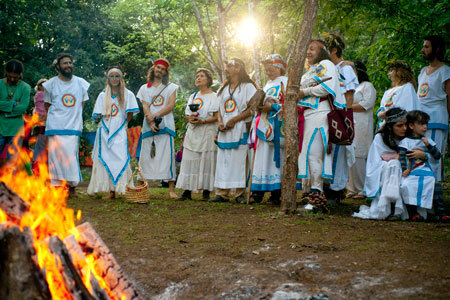 PachaMama makes an offering of its time, sleep and comfort while sending up prayers, songs, wishes and gratitude – as a collective and as individuals. Each night begins and ends with a short Sweat Lodge, opening and closing this powerful prayer. Days are spent in rest and listening to Palabra – talks given by the Mexica elders Malinali (Mexico) and Itzpaplotl (Puerto Rico), in which they share the wisdom of the Red Road through their understanding of Aztec or Mexica ways. Passing this knowledge on to this generation and the next allows the recognition of unity among mankind, walking together on the Earth as One. The Elders or “Abuelos” share their knowledge and comprise a powerful source of guidance in the Dual Dance – not only sharing teachings on traditional ways, but also providing counsel and using their wisdom to navigate the dance. Inter-generational togetherness is an integral part of of this tradition. 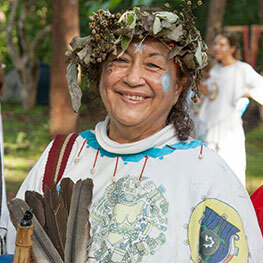 PachaMama has completed seven years of holding the Dual Dance on its land. – Dancers and Supporters will be spending four nights down by the River and should bring camping gear. – Prayer kits and a special outfit required for Dancers should be pre-ordered and purchased in the Jungle Shop. – Meals for Dancers and Supporters are included in the price, from dinner on the first day through brunch on the last. Supporters are much needed and appreciated to help hold the beautiful Dual Dance prayer. 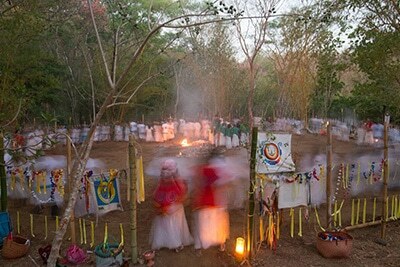 This is a unique Red Road ceremony that brings the village together, reinforces the ties among the community and nature and strengthens the bond between the Feminine and the Masculine. Supporters will hold various tasks ranging from serving meals to providing hot drinks to the dancers during the dance and working with the fire to prepare the sweat lodges. – Dancers and supporters will be sleeping down by the River for the four nights of the Danza and should bring camping gear. – A camping fee of $20 per day will apply only to participants who have not booked accommodation in PachaMama. – A special outfit required for dancers should be pre-ordered and purchased in PachaMama’s Jungle Shop. – Included in the price are all meals for both dancers and supporters beginning with dinner on the first day until brunch on the last day.